Two years ago, I was extremely fortunate to travel to Canberra for the Australian Computers in Education Conference 2008. Unfortunately, I wasn’t able to attend the entire conference this year in Melbourne but, none-the-less, was excited to attended the final day of ACEC 2010. I had heard so much about Gary Stager and was keen to see his keynote presentation, You Say You Want a Revolution? I know that Gary is sometimes controversial and his “straight talking” approach doesn’t appeal to everyone. However, I was in the right frame of mind for some straight talking and “tough love”, as he put it. Although Gary was direct in his presentation, I felt it was beautifully balanced with lots of humour. It was a reminder that, although there are some worrying things occurring in my school and in education in general, I must not give up. Not wanting to settle for an average 1:1 program but striving to help teachers create an excellent 1:1 program is paramount. My next session, Virtual Worlds – their roles in learning, teaching and professional development, was with Lindy McKeown who “planted the virtual worlds seed” after her incredible keynote at the VITTA Conference in 2006. I was truly amazed at what she showed us years ago in Second Life and I continue to be amazed today. My school is currently in the process of setting up our private grid, Begonia Island, so seeing how Lindy conducted her session entirely from her “Terra Incognita Island” was fascinating. Lindy was not physically present at the conference but “in-world” with Dr Bron Stuckey directing proceedings in the actual conference room. We examined the roles of virtual worlds, their potential and explored active or passive forms of learning. Getting the balance right when it comes to active and passive forms of learning in virtual worlds is important as we prepare to introduce our private grid to our students and staff. In Virtual Worlds for Education – don’t just imagine the possibilities, experience them, I was excited to meet Kerry Johnson who I had previously met via Twitter. Kerry has been a real inspiration to me as I have followed her OpenSim journey. She is as friendly, caring and delightful in person as she is on Twitter! Six months ago, I knew very little about OpenSim and the work of ReactionGrid, let alone how to actually setup a grid for our school. Now I am coordinating the development of our private grid and loving the steep learning curve! I owe a great deal of this progress to incredible educators like Kerry. I was amazed to hear that Kerry also had very little experience when she started her work to establish the ImmersED grid and I came away with lots of tips and a greater confidence in my abilities. Thank you Kerry! I don’t think of myself as part of a school, but part of a global movement. I need to stop thinking of myself as the Staff ICT Trainer at an Independent School. Perhaps that is why I lose faith and feel frustrated when progress is slow or does not occur. 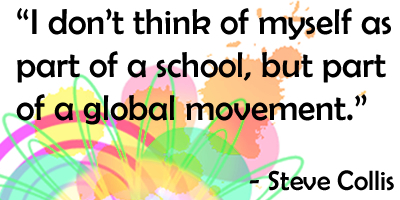 I am part of a global movement in education and that is a wonderful thing! Of course, there is so much more to a conference than keynotes, presentations and workshops. Having the opportunity to meet members of my Personal Learning Network is always exciting. These are people who assist, encourage, share and make me laugh. I’m not sure if they realise just how far reaching and valuable something as simple as a tweet can be, but it is something that I truly appreciate. In looking back on 2008, one of the most positive influences in my life has been establishing a PLN or Personal Learning Network. My PLN is not just made up of colleagues or even former colleagues. It is made up of educators from around the world, some of which I had the great pleasure of meeting in 2008 and some of which I certainly hope to meet in the future. Without doubt the most valuable tool I have used for establishing my PLN has been Twitter. Whilst it features photos of those in my PLN that I was fortunate enough to work with or meet in 2008, its purpose is to say thank you to everyone. The amazing support that you have provided me is truly appreciated. You are indeed my “Twitter Angels”!